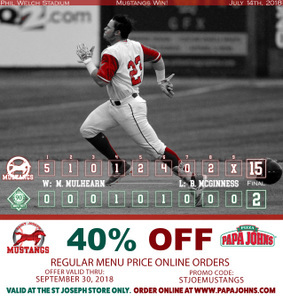 As kids were running around Phil Welch stadium opening treasure chests as a part of Fortnite night at the ballpark, the Mustangs wasted no time launching baseballs all over the field. Zachary Smith took the ball for a ride to the deepest part of the park in the first inning. The ball connected with the outfield wall just below the 400-foot marker. Brody Santilli and Josh Lincoln ran like the storm was coming, crossing home and giving St. Joe a 2-0 lead. There was no hiding in the bushes as the Mustangs used a five-run first inning to knock down the Regal Plastics 15-2 on Friday Night. With Smith standing at third, Alex Phillips shot a chopping grounder through a gap in the infield bringing the first baseman home and extending the Mustangs lead to three. The first 250 fans to the ballpark received a Phil Welch Stadium Replica, courtesy of Cody Vaughn and Thrivent Financial. St. Joe extended its lead in the second. Phillips returned to the plate and slashed a single down the left field line. Smith raced around the bases as the Mustangs took a 6-0 lead. Following the game fans got a front row seat to the Mosaic Life Care Fireworks Spectacular. Leading 7-1 in the fifth, Easton Fortuna got in on the action. The pitcher shot a double into the left field corner. Lincoln and Smith came around to score extending the Mustangs lead to eight. St. Joe tacked on four more runs in the sixth on the way to victory. Zachary Smith went 4-6 with two RBI and four runs scored. Daniel Covert went 4-6 with triple, two RBI and three runs scored. Patrick Dillon 3-4 with three RBI, and two runs scored. The Mustangs are 3-1 in non-conference games this season. St. Joe scored double digit runs in back-to-back games for the second time this season. The Mustangs will hit the road for a pair of games. They will visit the Chillicothe Mudcats on Monday and will travel to Clarinda for a matchup against the A’s on Tuesday. St. Joe will be back at Phil Welch 7 p.m. Thursday to take on the Clarinda in the final game of a two-game series. Come meet your favorite Mustang’s players at a pregame team autograph session beginning at 6:25 p.m.
Bring the kids for Family Night where kids cheer free and hotdogs are one dollar.